The Nora Dijon Shoulder Bag by Mona B. is constructed of up-cycled canvas from found military tarps and tents, and presented in dark camel, light stone, neutral beige with brown leather trim. There is a leather flap with magnetic tab closure on the front featuring a decorative nickel-toned metal clasp. There is a large open pocket on the front located under the leather closure. 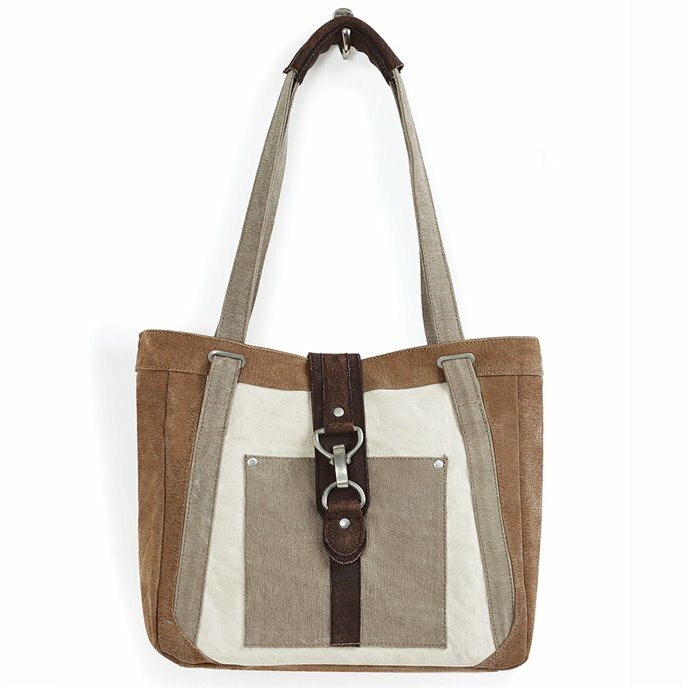 Dual shoulder straps are made of heavy canvas and leather, with 10" handle drop. Zippered closure. The interior is lined with signature Mona B. cotton lining, and has one zip pocket and two slip pockets. Measures 13"W x 10"H x 3"D. The fabric shows the history of its travels which may include stitch marks, minor staining and unique scars and bruises. Color variations and patches add to the uniqueness of each bag. Heavy cotton canvas and genuine leather.